While in Edinburgh, we visited Edinburgh castle (see the post below). 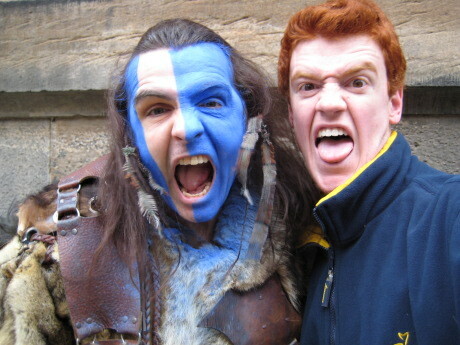 Outside was this guy, who dresses as William Wallace (anyone seen braveheart?) and will pose for pictures to collect money for charity. He’s already raised over a million pounds, and has even been on Getaway! I couldn’t pass up the opportunity! 2 users commented in " Edinburgh Castle "
oh what a facial mitchy! we are educationg your father with some quality tv shows. watching summer heights high hahaha. I know this guy(William Wallace), I’ve make a photo with him, and then we have talking about heavy metal, Manowar, Metallica and Iron Maiden.